Vapor Blasting is becoming a top priority for many motorcycle restorations. Why? With Vapor blasting you can clean restore and protect history with one simple step. With the flow based topography following nature of the wet slurry you can clean corrosion rust and years of grime and tarnish out of the tightest places in record time. No other process compares when it comes to not only cleaning but surface finishing parts for a rebuild. Dry blasting will remove precious marks and traits on engine and other components that add value to any restored motorcycle and wet blasting will simply clean over top of these marks without damage. 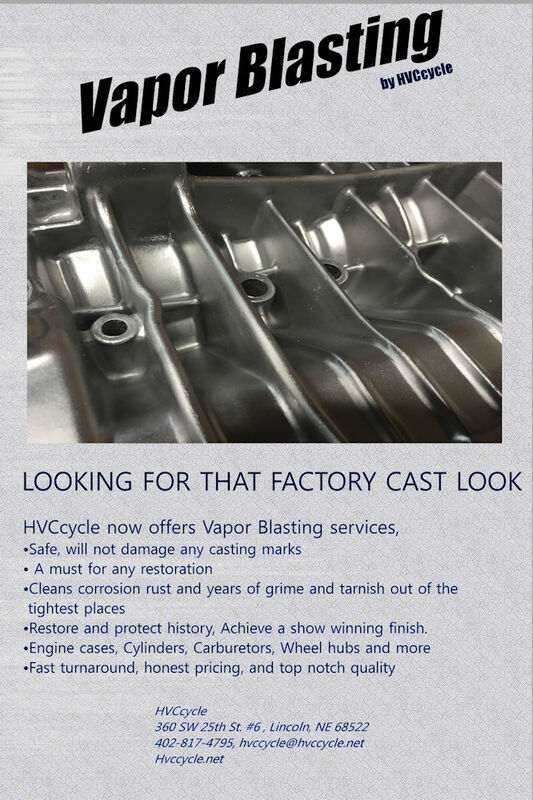 Send us your parts for Vapor Blasting today. Fast Turn Around, Quality work. Include you name, Phone Number, Address, E-mail. and a list of the enclosed parts. Example: If you send in your nasty greasy crusty engine cases from a 30 to 45 year old bike we are going to have to run them through the Hotsy Parts washer first. This usually takes a few runs with hand scrubbing in between. Once clean we can then Vapor blast the parts. This takes time so an additional charge will apply.